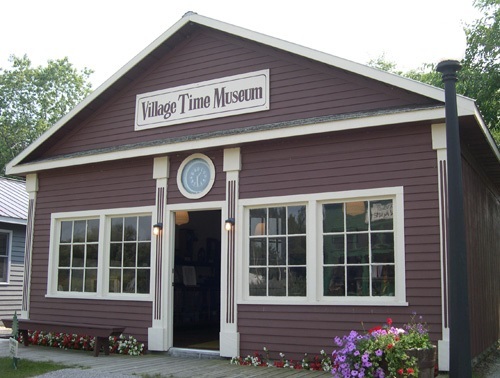 The Mason County Horological Society organized the construction of the Village Time Museum, affectionately known as the “Clock Shop” in 1990. 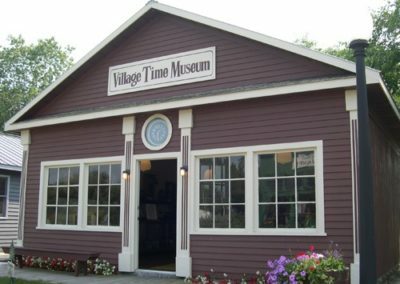 The clocks on display are primarily from the large donation of clocks and watches by Mrs. Hazel Oldt. The Pantograph (engraving) machines are from the Star Watch Case Company, which was one of the leading industries of Ludington for many years. It might be considered a form of mass production as the design that the stylus follows on the master plate is transferred identically 28 – 31 times. The brass clock, with the ornate long pendulum run by weights, is of French origin and is called a Morbier clock from the region of France where it originated. The style of decoration (the figures of farmers at the top of the case) helps to date the clock to approximately 1815. The Cuckoo clock dates from about 1850 and is a fine example of a Black Forest German Clock. The large Seth Thomas one-weight clock was from Hudsonville, MI. To be used, it was attached to external batteries to ring the bell for the Hudsonville High School during the early 1900’s.